Scotland needs ways in which a fast-growing number of sea tourists can be given all-weather, secure, environmentally-friendly ways of spending ‘shore time’ with us – so that they can gain a ‘sampler’ of the place that makes them want to come back, and invest, and live here. Looking at current sea-tourism, the present level of ‘harbour expenditure’ per head seems limited to about ten pounds (equivalent to one imported tartan bunnet). Attempts to open up the Highlands by road – as ever, the only thing most Scots politicians ever think of – have recently shown downsides of congestion, policing, and actual danger. The weather will rarely be on our side: excesses like yet more lumbering SUVs: ‘bankers tanks’ will take their toll, if popular tourist sites – like Iona – can be completely crowded out by a couple of small cruise liners. Rationalisation of rail services, where they survive, has also led to problems: a two-car diesel unit to Oban last August was booked out, the station (once a gem of Victorian woodwork, wrecked in the 1970s, replaced by a poky hut) had all its toilets closed. Travel on some highland buses in summer seems possible only through pre-booking on very thin long-distance services. Contrast with the near-military organisation of rail in pre-motor days where it had to deliver guests, servants, supplies to the big houses and hotels. That fine writer David Thomson, in Nairn in Darkness and Light, 1981 (see Seamus Heaney’s gem of a Guardian review) wrote of his uncle Lord Chancellor Finlay shipping over forty people (guests, staff, servants) each summer to his Newton House in the 1920s as normal. Yet in our literally half-baked present a drenching storm can be spectacular rather than deterrent – especially from a railway carriage. In notoriously damp Wales the two-foot gauge Welsh Highland Railway from Carnarfon to Porthmadoc packs the tourists into ten-car trains for a 25-mile trip through Snowdonia on a track less perceptible than one of Michael Portillo’s outfits. So: to survive we have to revisit Scotland’s ‘loser lines’ – the struggling, the long-closed, the planned-but-never-built – as potential arteries. And consider the process of getting tourists to and through them – and eager to return – as something to be developed strategically. It seems to be working for the Welsh – and not just the ‘Great Little Trains’. The Basque CAF rolling-stock company is to build its first UK plant at Newport, joining two narrow-gauge steam locomotive works near Porthmadoc and at Aberystwyth, attracted by the regional project of the ‘Valleys Metro to Cardiff’ using the old colliery lines. But the great pacemaker has been Switzerland’s Bernina line. When I first visited in the 1970s the long Rhaetian Railways branch from Chur to Tirano looked doomed, its little tram-like railcars a throwback to Baedeker’s day. Now it’s the Glacier Express with its all-glass panorama cars. Scotland’s travel sights are subtler but still compelling, even without the Harry Potter signposts, as the triumphant return of the big beasts of steam to the rebuilt Waverley Line has shown. So – think of the other Beeching-and-Marples victims: the Speyside line from Keith to Aviemore, swaying from distillery to distillery, or the Aberdeen to Ballater branch with its royal connections, even that long-lost Fort Augustus line from Loch Ness to the West Highland Railway at Spean Bridge. Economically hopeless once but, given changed travel patterns, perhaps in with a chance. Take, for example the problem of the Lairg dog-leg. This presently delays direct connection between Inverness and Caithness (Wick and Thurso) and the Northern Isles. Ministers have resisted a direct bridge-link from Tain via Dornoch to Golspie, but a combination of this with the loop would create an Invergordon-Tain-Lairg-Golspie-Dornoch-Tain circuit as a perfect miniature of the Highlands for cruise ship passengers, starting and finishing at (presently dreary) Invergordon. ‘Tourist attracters’ are often best when artfully constructed by modern means. Eilean Donan Castle – our Number Three after Edinburgh and Stirling – dates from 1935, built of concrete, slightly older than me or ‘Nessie’. 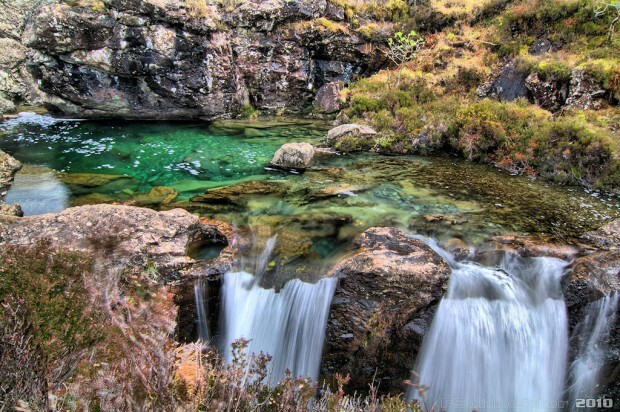 The Fairy Pools of Sligachan, being delicate, ought not to be besieged by SUVs (three of which do more road damage than a bus). These must be penally taxed to fund non-road routes, starting with the above, and to commission high-quality buildings, as well as transport and training for an altogether higher level of tourist service, aimed at creating the sort of country that really will conserve its culture and its history. Braveheart country – to find that the church where William Wallace married his Murrin was in a state of near collapse, an art-nouveau chapel which could have been an attractive visitor-centre was going that way; as in Oban the station toilets didn’t work – and a land grab by a Mexican road-metal firm was in prospect. In Kelso the stylish Aztec-deco High School where I’d studied and learned to work in wood and metal, was empty – ‘replaced’ by an out-of-town shoebox generating even more school runs: the last things that our struggling towns need – but all too typical of bankers, chartered accountants and quangocrats as the caterpillars of our commonwealth, and their appalling record in housing, planning and economic policy since the 1960s. I’m currently trying to compress developments in the world railway scene into a diary-size format: damn difficult because the news from the world is so good – on my own patch, the Tuebingen tram-train whirring along the Wilhelmstrasse past my office to the prospect of rebuilding all of the Waverley route. Out there the vast ‘belt and road’ project of the Chinese north of the Himalayas – on the other the return of small-scale rail to Jamaica, Hawaii, Mallorca and Mauritius. That heroic Victorian Anthony Trollope would have rejoiced, travelling by train for the Post Office thousands of miles a year and writing tens of thousands of words. Should someone join him he would address them thus: ‘Sir. Do you converse in railway carriages? I never converse in railway carriages!’ and go on to kill the dragon Mrs Proudie, or get silly Lord Silverbridge a sensible American wife. As people do in real life. Does gentrifying the wilderness turn the goose golden, or kill it? In Part1 Mr Harvie gave us a bizarre, disjointed, stream of consciousness trip up the west coast of Scotland. In Part 2 the tone has changed but we get the weird suggestion that Scotland should offer ‘environmentally friendly’ jaunts for sea tourists ie. people who pay to travel the world on enormous cruise ships burning millions of tons of diesel as they go. This kind of congnitive dissonance is not unusual, in fact it’s Government policy in most countries. The real enemies of the environment aren’t the climate change deniers – who should simply be dismissed – but the complacent Capitalists who think that a geo-engineering tweak here and a bit of greenwash there and everything will be just fine. All prose writing should now be divided into two camps. On the one hand the writers who are aware of the environmental shitstorm we are entering, and on the other the complacent sleepwalkers. Not quite sure where to place the rambling Mr Harvie. as a quarter million Keralans flee their homes.